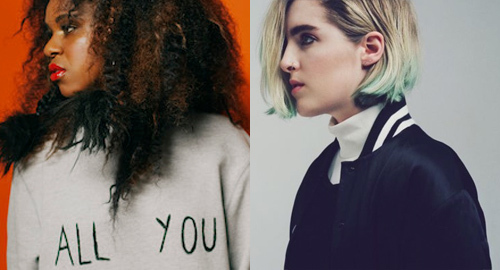 The two debut albums I'm most looking forward to this year come from "I look best in profile" singer-songwriters Nao (deliciously wonky funk) and Shura (gorgeous, dreamy pop). Thankfully, after a frustratingly long wait, their records are almost here. Not just around the corner, but walking up your street and getting ready to press the doorbell. To celebrate, they both released new material this week. Nao got in first, with the slinky, seductive Girlfriend - a cosmic riff on Prince's If I Was Your Girlfriend - which premiered on Annie Mac's show two days ago. "This song just came out of nowhere," she said. "Hopefully people will like it and sing along to it with me as well." The studio version is below, followed by Nao's first UK TV performance, on last night's Jools Holland ("a dream come true," she says). Shura, meanwhile, has just delivered the 80s-tinged dance thriller Nothing's Real - also on Annie Mac's show - calling it "the first piece of truly new music from me in a while. "This record is about fancying someone... then realizing that it’s probably not gonna happen," she said. She also likened the arrival of her album to being "seven months pregnant". "I've been told that I'm glowing, I'm kind of a bit bored of glowing now, can I just deliver the child? I'm just really, really excited about giving birth."